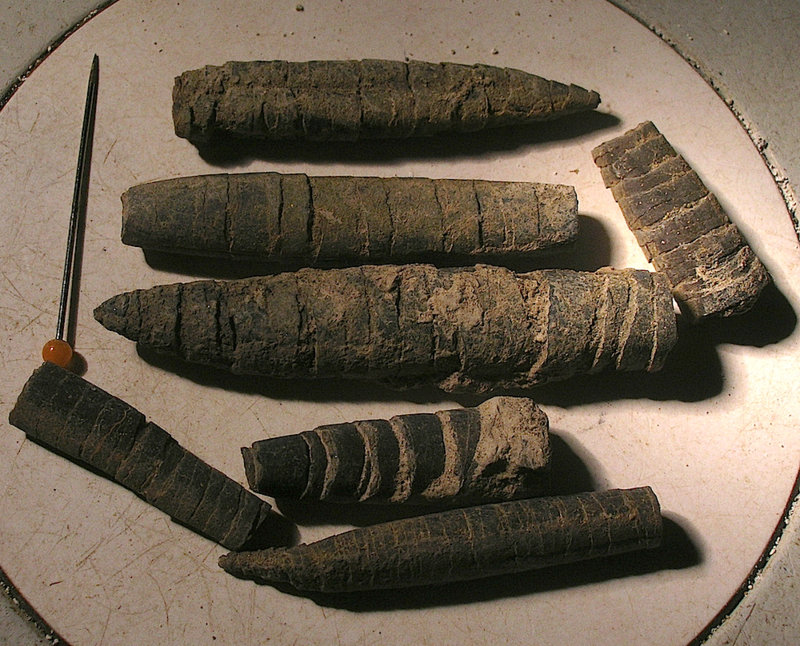 The so-called Ries belemnites are well known since geologists have been working in the Ries area. Embedded in Jurassic marlstones and claystones the heavily dissected rostra were unquestionably related with a sudden strong deformation that in times of the volcanic hypothesis was ascribed to the giant diatremic explosion and later as a result of the impact shock deformation. 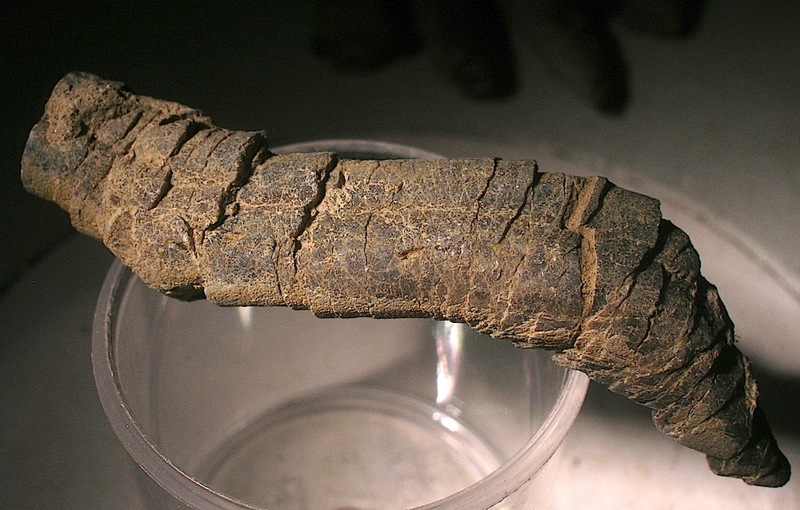 Hence, the fractured belemnites are frequently termed “shocked belemnites” although so far not any explanation has been given how the peculiar dissections developed fracture-mechanically. In his comprehensive and excellent paper on the multicolored fragmented material (the Bunte breccia ejecta included) Rudolf Hüttner (1969: Bunte Trümmermassen und Suevit. – Geologic Bavarica, 61, 142-200) also addressed the Ries belemnites (and related deformations of other fossils and carbonate concretions) of course emphasizing the sudden high-velocity reaction excluding plastic deformation in the soft marlstones and claystones. Hüttner assumed that the dissected rostra and geodes were in proof also of a cataclastic deformation of the embedding soft rocks which different from the rigid belemnites did not preserve the texture. A cataclastic shock deformation of the claystones and marlstones may in part have happened, we suggest however that the dissected rostra and geodes underwent a quite different process than simple cataclasis which is underlined by detailed observations and comparison with similar deformations from other impacts. 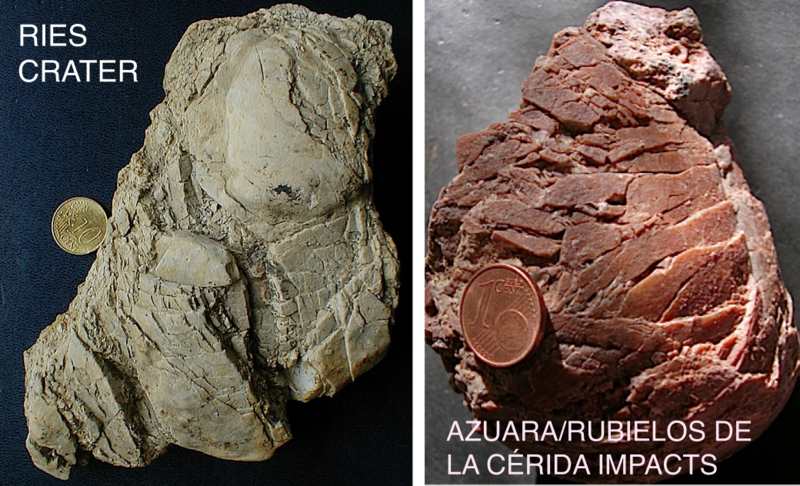 Here we show some typically deformed rostra and geodes and comparable deformations from the Azuara/Rubielos de la Cérida impact structures in Spain, and we refer to a more comprehensive article to be posted soon on our website. Fig. 1. So-called Ries belemnites from the Bunte breccia ejecta; Ronheim quarry. The field is 4.5 cm wide. Please not that the fractures and displacements do not always follow the radially structured rostra; oblique dissection is common. Fig. 2. A deformed belemnite rostrum like a bread cut to slices. Note the similar thickness of the slices which is a common observation with the dissected rostra. Fig. 3. A bizarrely deformed Ries belemnite. Fig. 4. 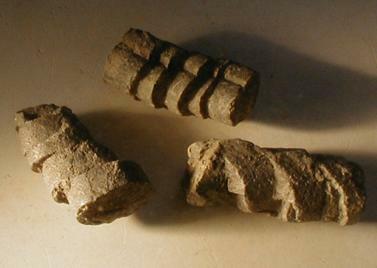 Little sheared Ries belemnites exhibiting the above mentioned “bread” dissection to slices of more or less equal thickness. This observation questions the assumed (Hüttner 1969) cataclastic deformation of both the fossils/geodes and the embedding soft sediment. Fig. 5. 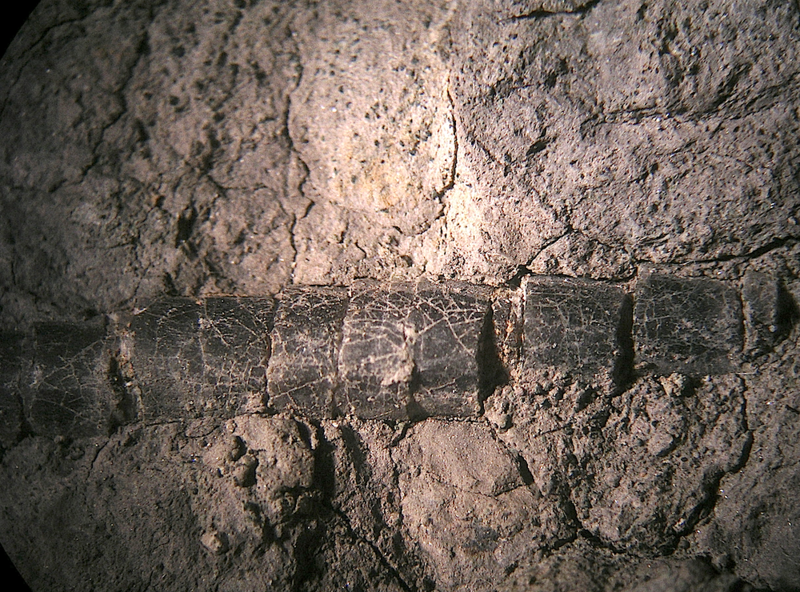 Often observed with the Ries belemnites: open fractures leading to elongation which points to tensile fracturing of the rostra. 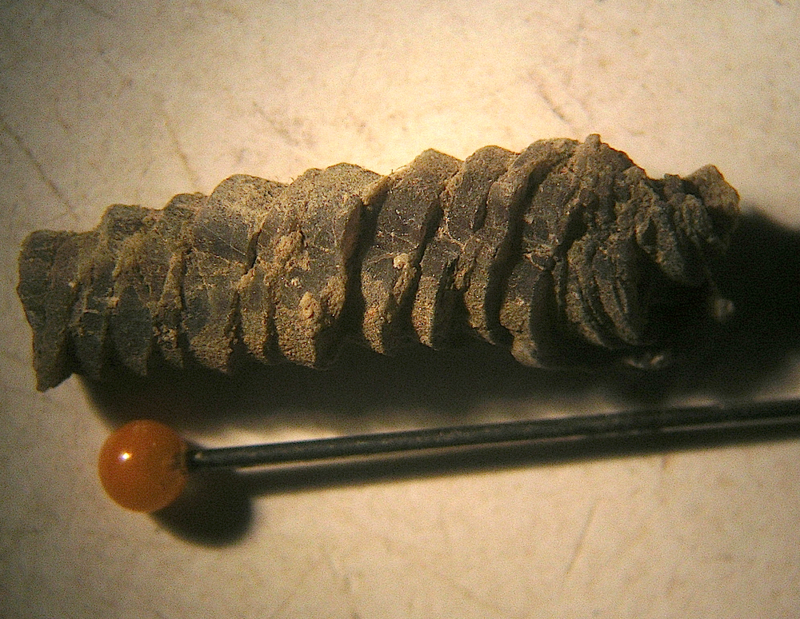 Belemnite as sampled in its original position in Jurassic claystone. Fig. 6. Also in its original position in the embedding claystone: A heavily dissected belemnite rostrum. Open fractures suggest tensile fracturing opposing cataclastic deformation. Sample by courtesy of P. Bockstaller. Quite similar deformations can abundantly be observed with concretions and geodes embedded in Ries crater Jurassic claystones and marlstones from the ejecta blanket. Different from the belemnite dissection the fractures are subparallel at most, rarely equidistant, and they frequently concentrate on certain parts, often in the middle, of the cobble. 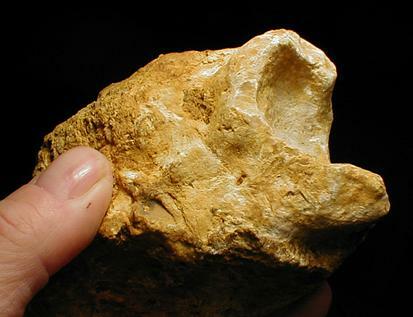 A complete cutting up of the geodes is rare, and widely open fissures indicating tensile stress are abundant. All this also opposes a joint cataclastic deformation of solid clasts and soft matrix. Fig. 7. 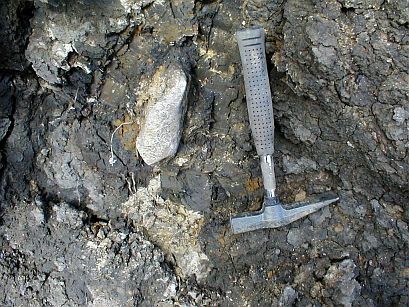 Limestone geodes sampled from soft claystones of the Bunte breccia ejecta show similar deformations as observed with the belemnites. However, the cutting to slices is much less developed, the fractures are subparallel at best, and the cobbles remain coherent. – From the Holheim Bunte breccia deposit (at the crater rim) mostly composed of Liassic and Dogger claystones. Fig. 8. Probably the clue to understanding the deformation process: impact shock spallation. 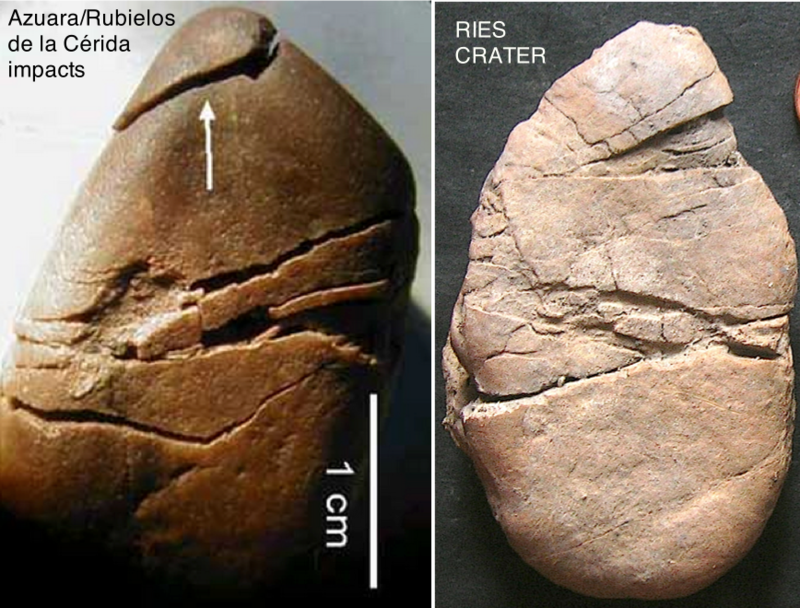 Comparison of a Ries crater deformed geode with a deformed quartzite cobble from the Spanish Azuara/Rubielos de la Cérida impact structures: The similarity is striking. 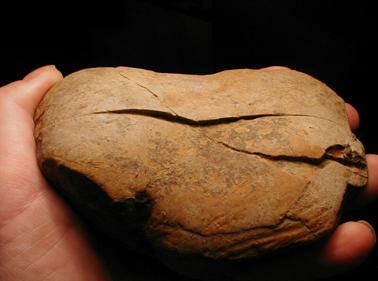 The deformed quartzite cobble is a typical example (more in the images below) of shock spallation that may lead to strong dynamic tensile fracturing. This impact process has lengthily been described what can be read HERE. Fig. 9. 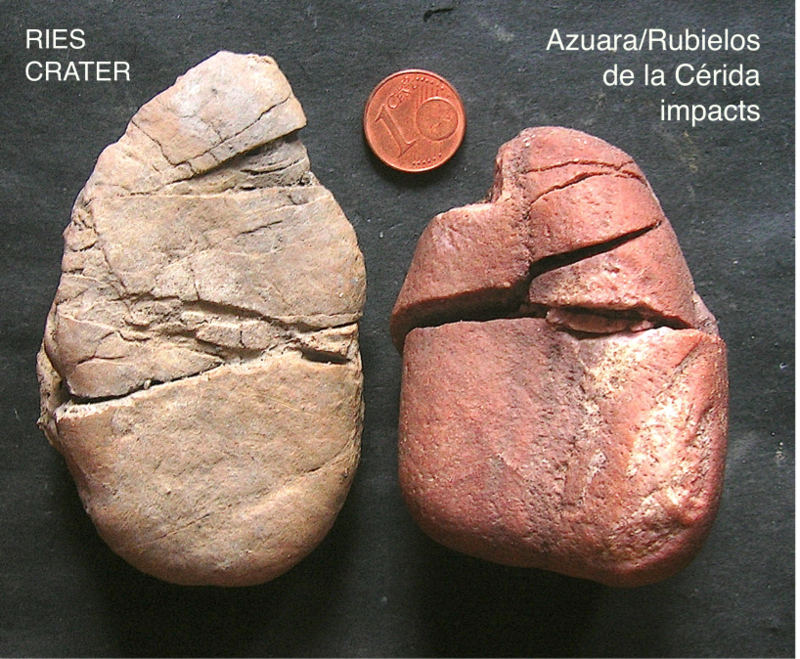 Practically identical breakdown of Ries crater and Azuara/Rubielos de la Cérida cobbles suggesting the same process, impact shock spallation, of formation. Fig. 10. 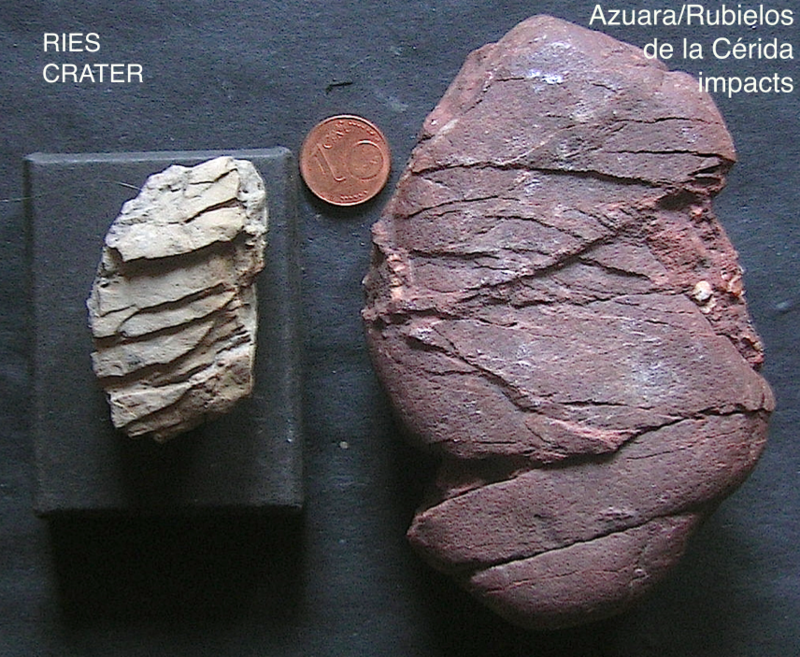 More similar to the Ries belemnites cut to pieces: the staircase-shaped fracturing of a Ries crater geode and a quartzite cobble from the Azuara/Rubielos de la Cérida impact structures, Spain. Fig. 11. Megascopic analogue to the Ries belemnites? The Malmian limestone block with prominent closely spaced subparallel displacements has been removed from the Bunte breccia ejecta (Ronheim quarry) where it was embedded in soft claystones. Unfortunately, the block doesn’t tell us when it experienced the peculiar deformation which is clearly not of pre-impact tectonic origin. If a kind of spallation was responsible of this bread-cut-to-slices deformation the block must have been exposed to the shock in a position that enabled impedance contrast between the hard limestone and a softer embedding material (or free air). Quite the same type of deformation is frequently observed in the ejecta of the Azuara – Rubielos de la Cérida doublet impact structure in Spain. There, also limestone clasts display subparallel fracturing and displacements without, however, being broken into pieces (Fig. 12). Fig. 13. 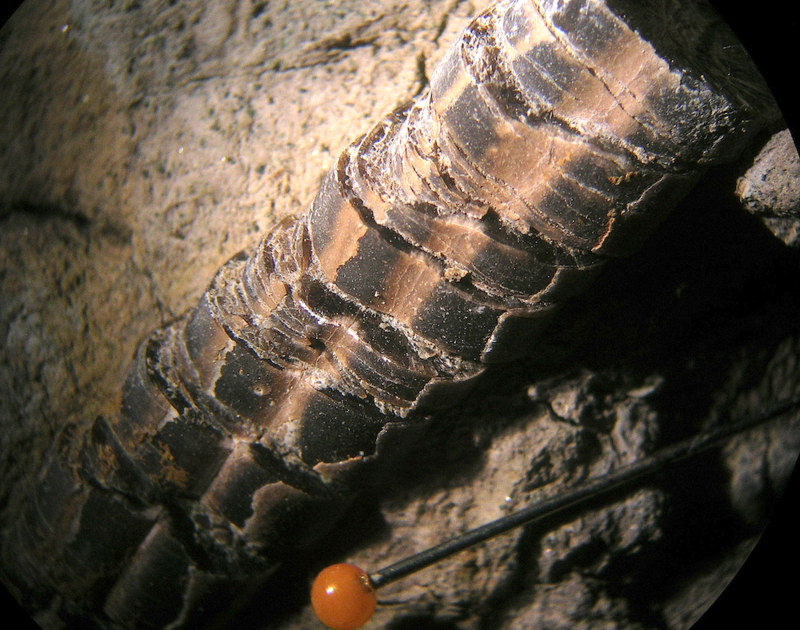 Limestone concretion from the Bunte breccia ejecta displaying peculiar rotated fractures. Note that the cobble is not broken into pieces. More about impact-induced rotated fractures on http://www.impact-structures.com/impact-spain/the-continuous-impact-ejecta-deposits-at-the-puerto-minguez/mesoscopic-deformations/, and in the article Ernstson, K. & Claudin, F.: Pelarda Formation (Eastern Iberian Chains, NE Spain): Ejecta of the Azuara impact structure. – N.Jb.Geol.Paläont.Mh., 1990, 581-599, 1990. Fig. 14. More similarities between the Ries crater and Spanish impact structures: Heavily squeezed but coherent limestone and quartzite cobbles: high-pressure/short-term deformation. 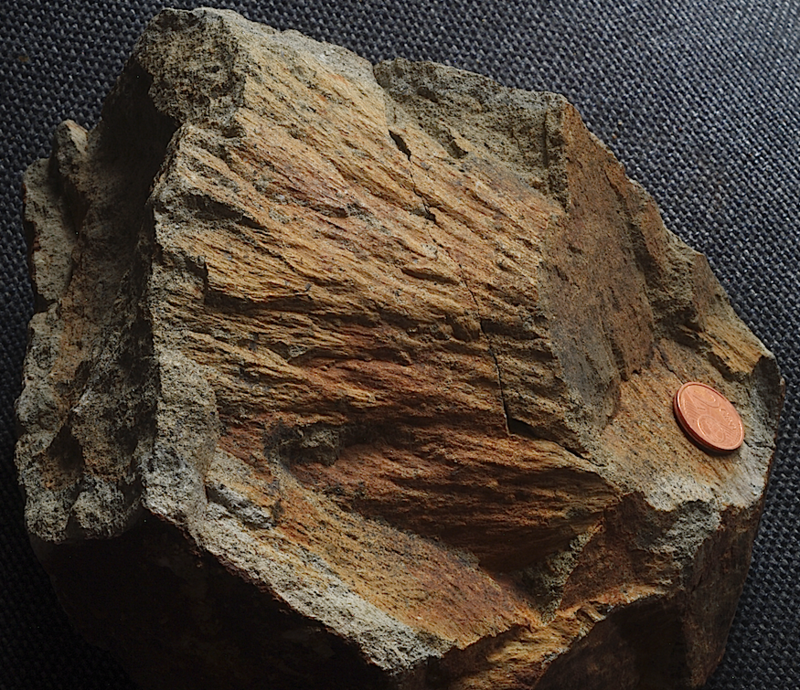 This limestone clast from the Ries ejecta also shows a prominent penetration mark caused by plastic deformation. With the help of a magnifying glass, striations and polish can also be observed. 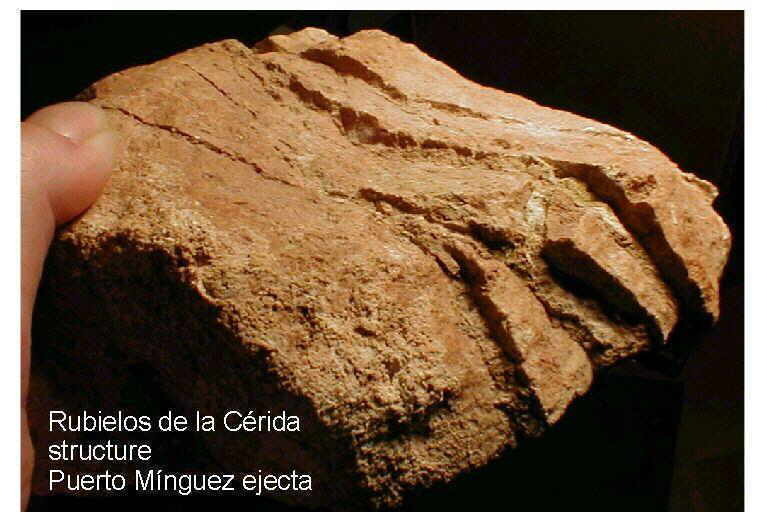 The same type of deformation is abundant in the ejecta (Pelarda Fm., Puerto Mínguez ejecta) of the Azuara – Rubielos de la Cérida doublet impact structure in Spain (see http://www.impact-structures.com/impact-spain/the-continuous-impact-ejecta-deposits-at-the-puerto-minguez/mesoscopic-deformations/ ). Fig. 16. Well-rounded, striated clast of Malmian limestone (not a concretion!) in Liassic claystones of the Ries Bunte breccia ejecta (Ronheim quarry). Sub- to well-rounded clasts are a well-known signature in impact breccias. In the Spanish Azuara – Rubielos de la Cérida doublet impact structure, an impact conglomeratization (our definition) can be observed that is characterized by an in situ formation of well-rounded clasts from massive limestone beds. 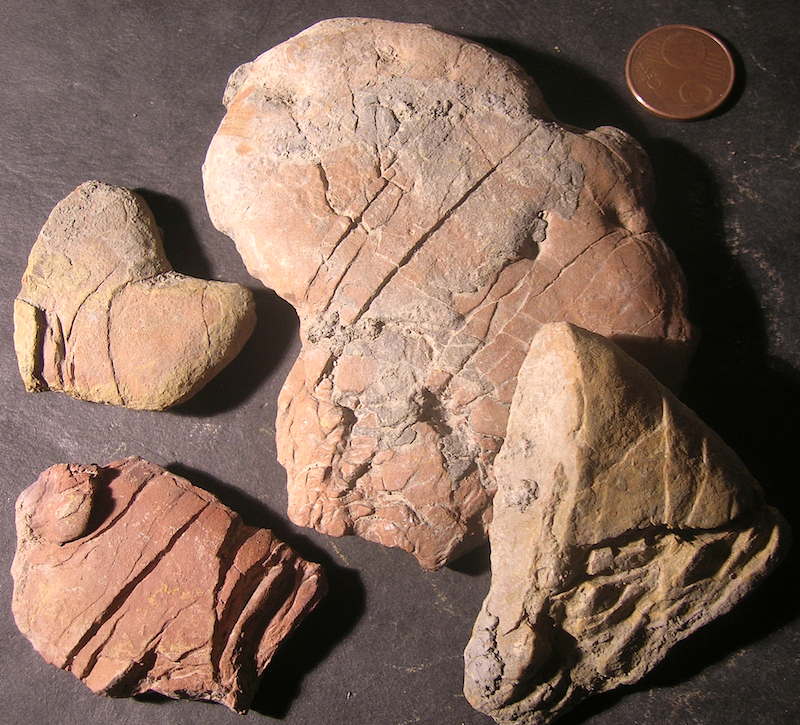 It is suggested that well-rounded limestone clasts in the Bunte breccia underwent a similar conglomeratization process upon impact deformation. It is further suggested that the well-known striated Buchberg pebbles found in the Bunte breccia ejecta have a similar origin – different from the current opinion that they are related with pre-Ries Tertiary conglomerates. Fig. 17. Shatter cone in hornblende kersantite. From disused Wengenhausen quarry. 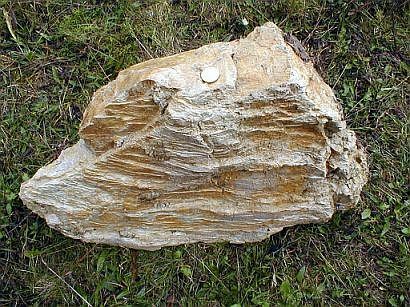 More about shatter cone formation, more shatter cones from the Ries crater and from other impact structures on http://www.impact-structures.com/impact-rocks-impactites/the-shatter-cone-page/shatter-cones-from-impact-structures-worldwide/ .